Home / Verbal / Flavour Boss Vaping Shop. Flavour Boss is your one stop vaping shop, for any vaper in the vaping community. Providing premium E-Liquids without the high cost and e-cig kits that wont let you down, all you have to decide is which flavourings u will like? Flavour Boss also allows you to make your own E Liquid and pick from the wide range of flavourings that are on offer. Any questions you may have about vaping, you can click on the "Knowledge Hub" tab on the flavour boss website to see the answer u may be looking for. Flavour Boss caters for any vapers preferred vaping method offering, PG (Propylene Glycol), VG (Vegetable Glycerine), Nicotine (aka additive), Flavour concentrates (the bomb), all four of these are elements that can be used when making your own e-juice, or are already in your pre-made E-Liquid. Propylene Glycol (PG) and Vegetable Glycerine (VG) are your diluents as nicotine and flavour concentrates are simply too strong (and, in the case of nicotine, too poisonous) to be vaped pure, but PG and VG provide the easy solution. You can mix PG and VG in variable quantities, even using just one if you wish. Common ratios are 70:30, 50:50 and 30:70. PG (Propylene Glycol) is an organic chemical compound and produces a stronger throat hit when used in any eliquid. VG (Vegetable Glycerine) is derived from natural vegetable sources, can taste slightly sweeter and affects the flavour more then if u were using PG. VG (Vegetable Glycerine) is a lot smoother on throat when inhaling and also produces more vaping clouds. Flavour Boss provide all the accessories you need when making your own e-juice. The diluents PG and VG, syringes, bottles and the boss shots concentrates to turn your e-liquid into your own delicious concoction. The Boss Shot concentrate sent to me is the stripple reborn, a mix of strawberry and raspberry ripple icecream that is an E-Liquid concentrate which is not ready to vape. 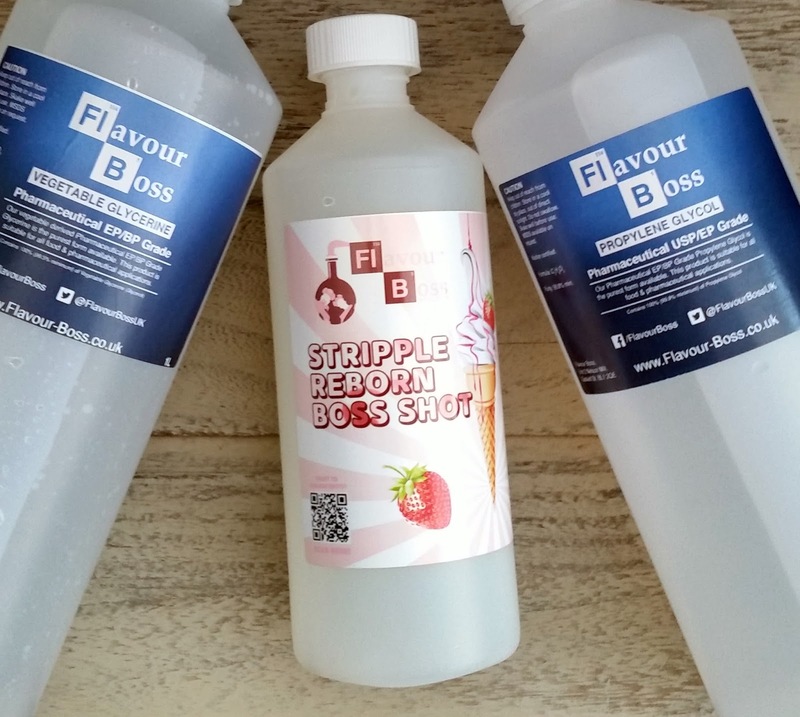 Flavour Boss supply the recipes mixed to the correct percentages in a bottle ready for you to add Propylene Glycol, Vegetable Glycerine and/or Nicotine to fill the bottle. You Mix at 20% and then leave to steep for 6 weeks. Flavour Boss sent me a collection of ready-to-vape E-Liquids fresh from their flavour factory. Krispie Treats - sweet marshmallow cereal bar. Purple Slush - grape, berries and boysenberry. Sugar Lips - Watermelon, Strawberries and Kiwi with delicious marshmallows. Boss Reserve - Bananas, Caramel, Peanut Butter, Vanilla. Tropical Typhoon - Pineapple ice cream with strawberry and with lime flavour. Stripple Reborn - strawberry & raspberry ripple ice cream. Mr Croc's Penguin Juice - guava, pineapple and grape energy drink. Biscuit Eater - creamy vanilla. Pink Lemonade - enticing blend of pink things and lemonade. Lunch Ladies Lemon Tart - Tangy Lemon. 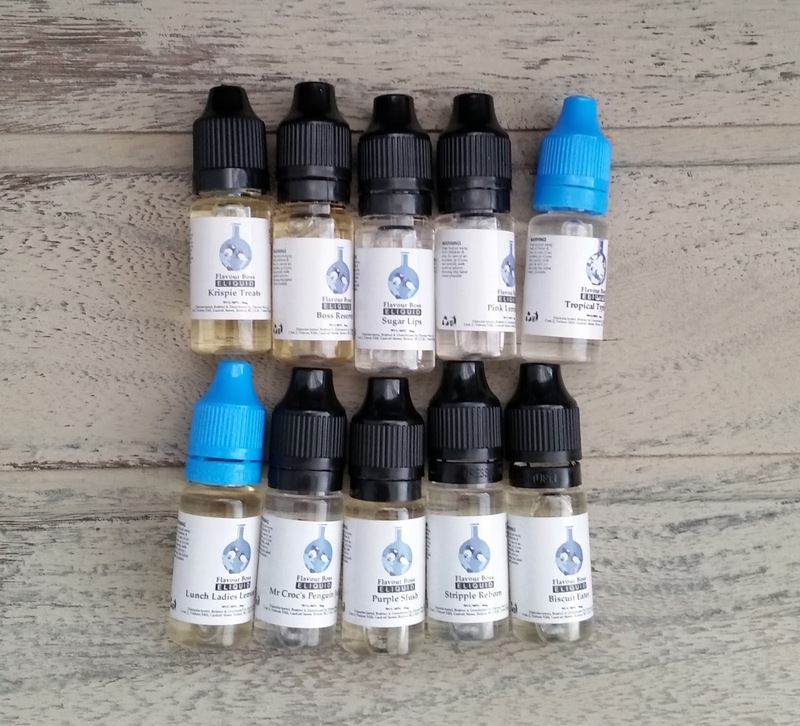 Each of the easy to use bottles comes with 30ml of pre-mixed e-cig liquid, all you need to add is nicotine (if you want it!). A 30/70 ratio of Propylene Glycol to Vegetable Glycerine, Flavour Boss e-juice is smooth on the throat and produces quality clouds without affecting flavour potency. Flavour Boss offer a huge range of hardware that is every vapers best friend. 1 x Reuleaux RX GEN3 Vape Mod. 1 x Quick charge cable. 1 x Wismec GNOME Tank. 1 x WM02 Dual 0.15ohm coil (pre-installed). 1 x WM03 Tripple 0.2ohm coil. 1 x Delrin drip tip. The new Reuleaux RX GEN3 TC box MOD has a smaller, lighter and more ergonomically designed body for carrying around all day. 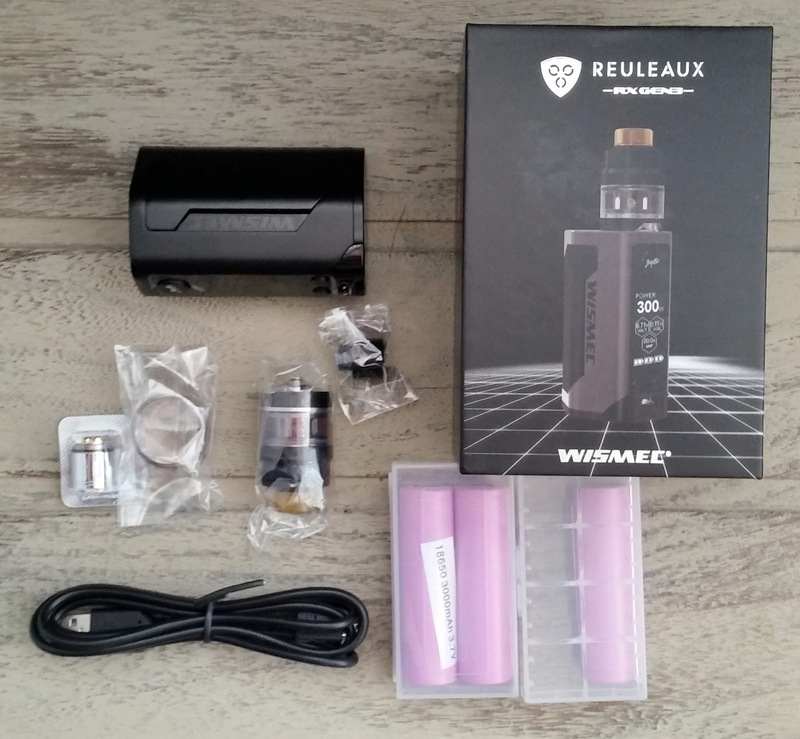 Powered by triple 18650 cells, the RX GEN3 supports a max 300W output power and will provide enough power for high wattage vaping. Dual circuit protection, 1.3-inch Huge OLED screen, 2A fast charging and the latest bespoke firmware offer a much better operating experience. It also includes a 2ml GNOME tank that comes with an all new WM coils for huge vapor and optimal flavor. 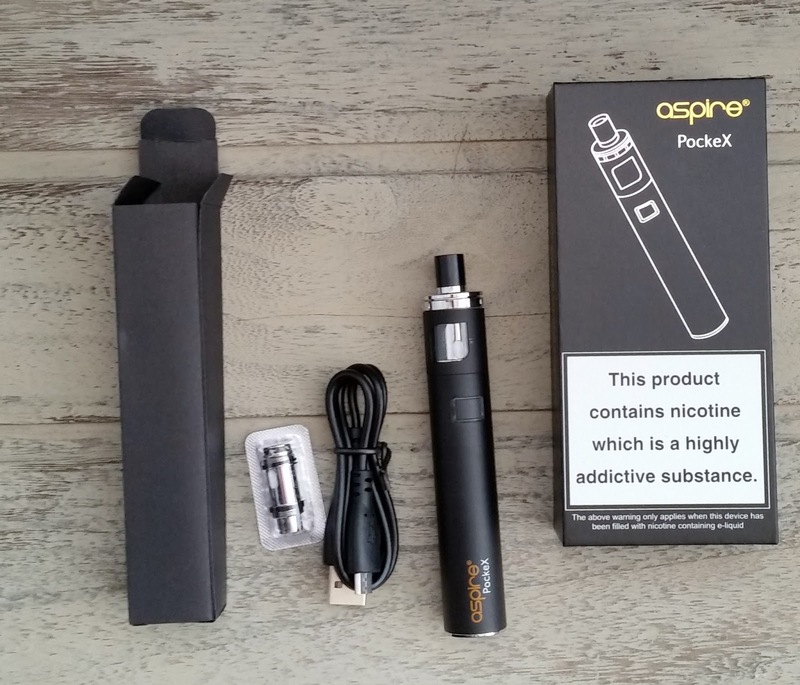 The Aspire PockeX is another choice available from Flavour Boss. The PockeX is an all new, discreet, low profile sub ohm device from Aspire, standing no more than 12cm tall and less then 2cm wide, it is true that good things come in small packages as this all-in-one device will fit all pocket types. When it comes to innovative electronic cigarettes, this device is up there, becoming one of the most popular vaping devices. Available in Black, White, Stainless Steel and Rose Gold, the PockeX is one of the shortest all-in-one devices on the market to date, yet still maintains the quality expected of Aspire. The top-fill design means you can replace your coils without draining the tank which is a massive bonus, combine with a TPD compliant 2ml tank capacity and a 0.6ohm coil, this device has it all. Samsung 30Q 3000mAh, Sony VTC5A 2500 mAh, LG HG2 3000mAh, Samsung 25R 2500mAh. You can also purchase coils & wires to replacements parts, all your vaping problems and needs are solved thanks to the huge range available. The checkout process is quick and easy and you are updated on your package with speedy delivery. Head on over to Flavour Boss, the high quality vaping shop. X Neil.